I remember watching the first season of The Fosters and thinking that I had never seen so many characters of color on the same show before. It was a shock to the system. It shouldn’t have been. But it made me curious to see how the show would unfold and if it could, in fact, give these characters the depth and dimension they deserved. So, I kept watching. And as I did, I half expected The Fosters to take the beaten TV show path and eventually shift its less mainstream characters to the background. That never happened. Instead, The Fosters gave each of its characters—including the LGBT and racial minority ones—an equal amount of on-screen real estate, respect, and importance. That, too, was a shock to the system. As I watched on, it soon became apparent to me that The Fosters wasn’t pussyfooting around; it was serious about giving voices to those less heard. Over the course of the show’s four seasons, the creators of The Fosters have shown audiences that they’re utterly fearless. The show not only tackles the issues of race, foster care, and being LGBT, but it uses its platform to call audiences to question their own personal views. Week after week, viewers are prompted to look at themselves through the lens of the Adams Foster family and ask, what if this were my family? We’ve all asked ourselves this question at one point or another. 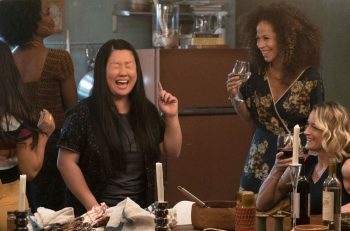 That The Fosters frames this question around a multi-racial foster family headed by a lesbian couple gives the show a unique advantage over others in its genre. By simply featuring sympathetic and relatable characters that challenge the status quo, The Fosters positions itself as a bridge between opposing politics and ideologies in our society. It continually asks viewers with different values and viewpoints to empathize with those on the other side of that bridge. And in so doing, The Fosters manages to speak to both conservative viewers who keep ‘traditional’ values top-of-mind as well as more liberal audiences who view families like the Adams Fosters as par for the course. This cross-cultural, cross-political, cross-ideological approach isn’t something all TV shows do well. But The Fosters does. One of the reasons The Fosters resonates with so many is that it presents a diverse cast of characters and inclusive storylines within the context of a single, cohesive family unit. There’s no cult-like mentality; only a set of Joe Schmo individuals trying their best to navigate confronting situations. And in this way, The Fosters represents America itself. We, as a nation, are also a cohesive unit comprised of individuals overcoming life’s hurdles. At our cores, we are the same. It’s a universal concept and one that makes the question of sexual orientation, ethnicity, or personal history completely irrelevant. Suddenly, American viewers all across the board can understand or, at least, sympathize with, a black woman struggling to come to terms with her half-brother’s racist remarks. Or a downtrodden foster kid who wants nothing more than to protect her little brother. Or a lesbian grappling with the realities of breast cancer. Ultimately, The Fosters speaks to the human side of every viewer, no matter whom they love or what they look like. At the end of the day, it doesn’t matter that Stef and Lena are a lesbian couple. It doesn’t matter that Mariana and Jesus are Latino. It doesn’t matter that Callie and Jude are foster kids with sketchy backgrounds. What does matter is that viewers are invested in seeing these characters overcome their struggles. In essence, what The Fosters asks audiences to do is finally see the marginalized as they see themselves: as human beings. How many other shows can honestly say the same? Marketing copywriter by day. Entertainment/creative writer by night. I love all art forms (film and television, in particular) and seek to explore the deeper meaning in it all.